Let's hear it for playing politics with the death of Sen. Ted Kennedy. Mind you, I'm not a big fan of the man, for a variety of reasons. But if it's wrong to exploit his death for cynical political purposes, then it's equally wrong for Democrats as for Republicans. Yet now there's a bill before the Massachusetts Legislature, which would give the Governor (Deval Patrick, Democrat) the right to appoint an interim Senator, to fill Sen. Kennedy's seat, just for the next few months. (A special election is scheduled for January 19.) Kennedy himself asked that this be done, shortly before he died. What's wrong with that? Doesn't it make sense for the Governor to appoint a Senator to fill a vacant seat? Yes, it does, except that that right was stripped from the Massachusetts governor, by this same Massachusetts legislature, back in 2004 (with Kennedy leading the charge). We had a Republican governor then -- Mitt Romney, in fact -- and there was concern that, if Sen. John Kerry won the Presidency that year, Gov. Romney would appoint a Republican to replace him. Now that there's no fear of such things -- Gov. Patrick is about as likely to appoint a Republican as he is to become one himself -- the Legislature wants to reverse itself. But they're not taking chances; there's even talk of wording the bill to require the Governor to appoint a member of the same party. Folks, it doesn't work that way. You hold your Senate seat, or House seat, or Governorship, or whatever, so long as you continue to get elected; if you die, that seat is up for grabs. This is an unexpected opportunity for the people to choose someone new, to their liking, not a ploy to let the party in power stay in power without additional elections. Folks, if President Obama's phone book of a health-care bill can't pass without a filibuster-proof majority, then it bloody well doesn't deserve to pass. 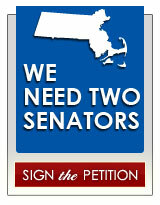 WeNeedTwo.org is a project of MassVOTE, a non-partisan voting rights organization. We work with community-based non-profit organizations to increase voter education and turnout across Massachusetts. Yup, that sounds pretty non-partisan to me -- in the sense of "we're non-partisan here. We all vote Democrat". I've already signed the petition, thanks; I reminded Beacon Hill that, if they think the voters aren't paying attention, they're sadly mistaken. If you're a Massachusetts resident, you might want to click the link at the top of this post and offer your own opinion. UPDATE: Sorry, I wasn't able to find an online copy of the bill itself. I did find support for the bill from Gov. Patrick and Lt. Gov. Tim Murray, President Obama, the Boston Globe, and others I'd expect to line up behind this cynical move. Kudos to a Massachusetts Democrat who actually does stand up for what's right, whether it helps his party or not. UPDATE 2: As of Friday, Sept. 18 2009, The Massachusetts House has voted in favor of the bill, 95-58. The Massachusetts Senate will debate it next week, and presumably vote on it then. It's a good thing that Ted Kennedy isn't alive to hear the charges of hypocrisy that would be leveled against him; after all, he led the charge in 2004 of denying Gov. Romney the precise right he insisted Gov. Patrick must have now. On the other hand, this being Massachusetts, it probably doesn't matter; Sen. Kennedy weathered much worse storms than that, to the point that some people doubted anything short of death could remove him from office. As I heard someone say last week, it doesn't matter who runs in the special election in January; Ted Kennedy will probably win anyway. UPDATE 3: Yup, it's official.